Come in a wide range of options from small shelves to store items in garages or stores departments right though to metal racks that store pallets usually called pallet racking. They come in a wide range of sizes, finishes and weight loadings to store items as diverse as clothes, car tyres, products and food. In fact there is such a differing range of metal rack shelves available we find many private and business customers can become overwhelmed with choice. We have access to thousands of metal rack shelve products but our team can fine you the best product at the best price by asking a few simple questions about what and how you wish to store. We have the benefit of complete independence so we can sell you what best suites your needs rather other suppliers that are forced to sell from just one manufactures stock. Our clients store such a wide range of goods our experience can save you time and money and make sure you end up with the right shelves for you. 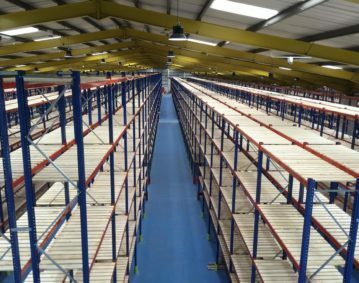 We offer a free site survey for commercial shelving and racking projects, our design team have many years experience in racking and shelving for a wide range of applications in a wide range of industrial sectors. We offer a full range or racking and shelving with all the associated products you may require like plastic storage boxes and bins for parts storage or picking and dispatch operations. Our shelving and racking comes in a wide range of sizes to fit your needs with various finishes and weight loadings to make sure you get the most from your budget. We have a team of highly skilled installers waiting to carry out a top quality and professional shelving or racking installation. Making the most of the space you have and adding additional storage space and making your working environment safer and more productive.